When we started out our autograph campaign in the spring, I sent a letter to minor league teams seeking donations of any old card sets they might have left. We have lots of minor league baseball teams in the area, both affiliated and independent leagues. This would give us the opportunity to get those cards signed and we couldn't afford to buy them all. I knew not all the teams would respond and would be thankful for any team that did respond. 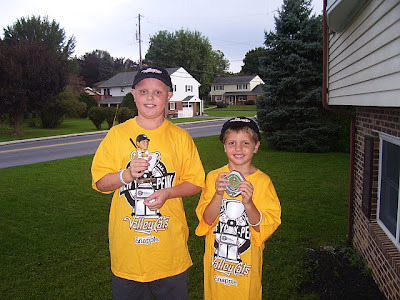 If you read the early posts on our blog you can see that many teams participated. Gavin and I couldn't wait to check the mail to see if we got something. There is one team that had several responses...the Tri City Valley Cats. They are the short season team for the Houston Astros. Back in April, Michelle Skinner sent us a package that included LOTS of team card sets, t shirt, Ben Zobrist bobble head, and stickers. That was by far more than we expected and we were so thankful...but there's more. 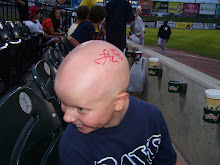 We received a letter in June stating that the Valley Cats and Finnigans Sports Cards would be teaming up to make a donation to NAAF through Autographs 4 Alopecia. 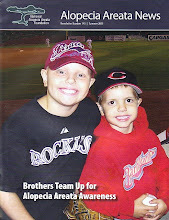 We headed out the week before school to catch a game in Troy, NY and receive a check for NAAF. Unfortunately this happened and we never made it. When we got home from Cleveland there was a package waiting for us from Michelle and the Valley Cats. When we opened the box, there were t shirts, hats, stadium replica, baseballs, 2011 team card set, and a Hunter Pence bobble head. There was also a check in there for $300! We are so thankful to Michelle, Jeff at Finnigans Sports Cards, and the entire Valley Cats organization for their thoughtfulness. We will definitely be visiting the Capital region next summer and already can't wait! That’s is very nice post which you sent on this site its maybe very helpful for people and me also it’s a real good job which you doing .